PHILADELPHIA, PA, April 12, 2018 — Students from the School District of Philadelphia’s John Bartram High School are headed to this year’s Aspen Ideas Festival after claiming first place in the Aspen Challenge: Philadelphia competition at Drexel University on April 11. A team comprised of eight students and two educator-coaches came up with a winning solution to Mural Arts Philadelphia executive director Jane Golden’s challenge to use art to raise awareness about the school-to-prison pipeline and promote restorative justice and education. It was enough to earn them all-expense paid trips to present their solution at the Aspen Institute’s annual flagship gathering of global leaders, influencers, and entrepreneurs in Aspen, CO. George Washington and Northeast high schools placed second and third, respectively. 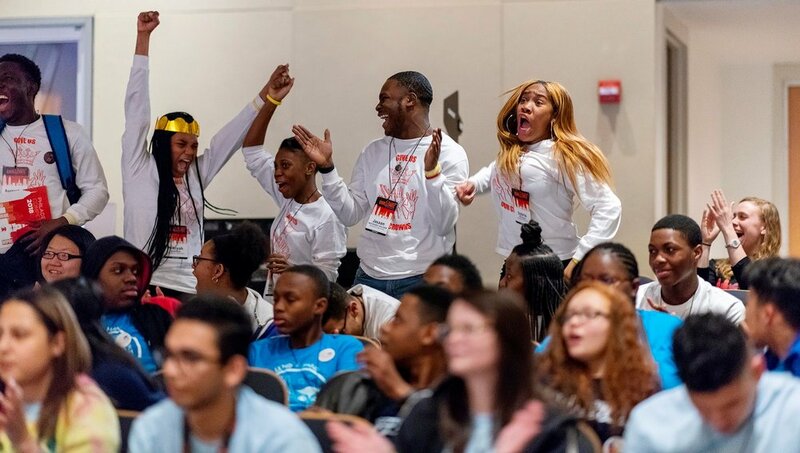 "The Aspen Challenge is truly an opportunity for young people to encourage and inspire each other, and the adults around them, to solve critical issues facing their communities," said School District of Philadelphia superintendent Dr. William R. Hite. "Thanks to the experience of participating in the Aspen Challenge and the dedication of their teachers and coaches, our students are uniquely positioned to lead fundamental change around issues like climate change, the school-to-prison pipeline, and poverty."